Vincent van Gogh’s Sower with Setting Sun, 1888, is a small painting of 32 x 40 cm. It was inspired by a 1850 painting by Jean-François Millet of a sower. Vincent felt an intense bond with Millet’s art. Both Vincent and Millet were Christians and the former regarded the latter’s work as a preeminent example of “Christian” art. For Vincent this meant an art that breathed the spirit of Christ, a spirit of peace and redemption, into a troubled world. Vincent saw in Millet’s Sower a reference to Christ’s parable of the sower. Vincent, who had spent several years as a theology student and evangelist, regarded his own art as a form of ministry; he hoped that his art would bring comfort and solace to the spiritually and socially downtrodden. For van Gogh the motif of the sower was a type of self-portrait. The artist is the sower; we are the soil. But what sort of soil are we? Are our eyes and hearts open to Vincent’s art? Do the cares of this world cloud our sacred imagination, that God-created capacity to see the material world as a spiritual world of infinite dimensionality? Vincent van Gogh’s Sower with Setting Sun changed my life. Although I had been surrounded by art and architecture of great significance all of my life, I did not have the eyes to really see the art. I don’t know why this painting presented itself in a new way. However, when I encountered Sower with Setting Sun in the Vincent van Gogh Museum in Amsterdam, I understood it as something more than a picture, more than a type of interior decoration. I recognized the motif of the sower. I knew I was the soil in that parable. I understood that Vincent was challenging me to open myself to it, to let the work take root in me. Since then, for almost two decades I have pursued a vocation as an art historian, including a master’s thesis on the faith and art of Vincent van Gogh. My work has been motivated by a particular interest in how works of art can visually realize and thereby implant within the viewer spiritual themes that are alive in the present. That is, if we have the eyes (or visual literacy) and spirit (or sacred imagination) to engage the work. Van Gogh’s Sower with Setting Sun is a horizontally oriented work. It develops a reciprocal relationship between the figure of a sower on the left and a tree on the right. The anonymity of Vincent’s sower allows us to identify with him, just as Vincent had identified with him. In the presence of the tree, we have an image of resurrection. This tree, which grows up beside the river, fills the space with evidence of life and growth. In the background, to the right, there is a house. Perhaps it is the sower’s house. It may evoke the rest and joy of home that Vincent longed for. This humble sower and his labor are blessed by a sun which sets behind the figure like a halo. There are numerous “disguised” halos in Vincent’s oeuvre but this is probable the most obvious one. Instead of resorting to symbolism which he felt was outdated, Vincent preferred to “paint men and women with that something of the eternal which the halo used to symbolize, and which we seek to convey by the actual radiance and vibration of our coloring.” Indeed there is a radiance of color that pervades this painting. 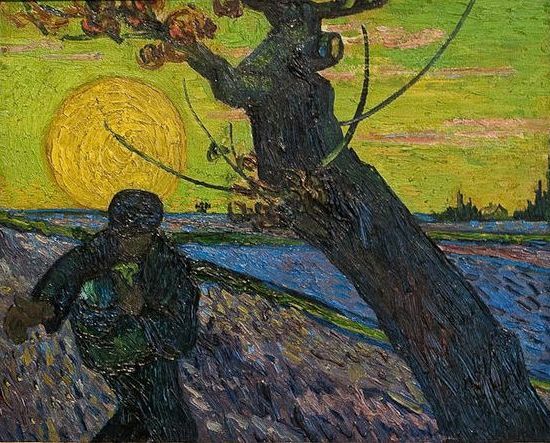 When I first encountered Vincent van Gogh’s Sower with Setting Sun, I connected it with the parable of the sower. However, it increasingly spoke to me of Christ’s words in John 12, “I tell you the truth, unless a kernel of wheat falls to the ground and dies, it remains only a single seed. But if it dies, it produces many seeds. The man who loves his life will lose it, while the man who hates his life in this world will keep it for eternal life.” I think that van Gogh wanted to be this sort of seed. He would be willing to lose his life in order to save it. Speaking of the resurrection of the body, the Apostle Paul writes in 1 Corinthians 15 that a seed sown in weakness is raised in glory; it is sown perishable and raised imperishable. I have had a foretaste of this sort of transformation as the art of Vincent van Gogh, works of art which are themselves perishable objects, have become within me imperishable experiences of faith. Dr. James Romaine is a New York City based art historian who is an Associate Professor of Art History at Nyack College. He has a Master’s degree in art history, with a thesis entitled A Modern Devotion: The Faith and Art of Vincent van Gogh, from the University of South Carolina and a Ph.D. in art history from the Graduate Center of the City University of New York. He is the cofounder of the Association of Scholars of Christianity in the History of Art, www.christianityhistoryart.org.